The Portland Timbers and Portland Thorns FC professional soccer clubs have selected Leyard and Lighthouse Technologies for five video screens in their transformed Providence Park stadium in downtown Portland. The installation is the first resulting from the new partnership between Leyard and Lighthouse formed in late 2018. The installation encompasses five video screens aimed at heightening the fan experience when Providence Park reopens this summer, highlighted by a signature new LED board/scoreboard behind the south goal that features more than 150 percent additional display area. 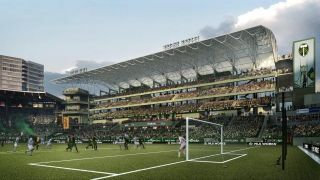 The home venue for both the Timbers of Major League Soccer and Thorns FC of the National Women’s Soccer League is in the final stages of a multiphase, $85-million transformation that includes extensive enhancements to the entire stadium. Notably, the project includes the addition of approximately 4,000 new seats as part of a new three-tiered seating structure constructed on the east side of the stadium. The installation is the first resulting from the new Leyard and Planar, a Leyard company-Lighthouse partnership announced in December 2018. By combining Leyard’s fine-pitch LED and Planar’s LCD offerings with Lighthouse’s LED solutions designed for the sports market, the goal is to offer new innovations to sports and entertainment customers across North America.